NEW Hallmark Season's Treating MUSICAL SNOWMAN from 2010. CERAMIC, 9" high, 6" wide. Press button to watch the gumdrops on the snowman light up in sync with 3 Holiday songs: "Jolly Old St. Nicholas," "We Wish You a Merry Christmas" and "Deck the Halls." He is a special table top decoration to enjoy for years to come. New mint condition with tags & batteries. Items Similar To "NEW! 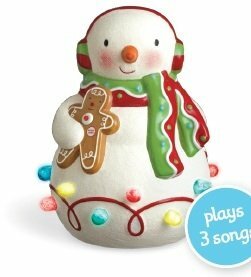 Hallmark 2010 Season's Treatings MUSICAL SNOWMAN w/ lights"